I made this wedding card for my nephew and his new wife. The design is loosely based on the one shown in this blog post. The dress shape was cut from a Silhouette store file and then put through an embossing folder (I think it's called Plum Blossom). The pink background was embossed with an embossing plate. Gale, this is gorgeous!! So pretty with all that embossing and the beautiful color. So pretty! 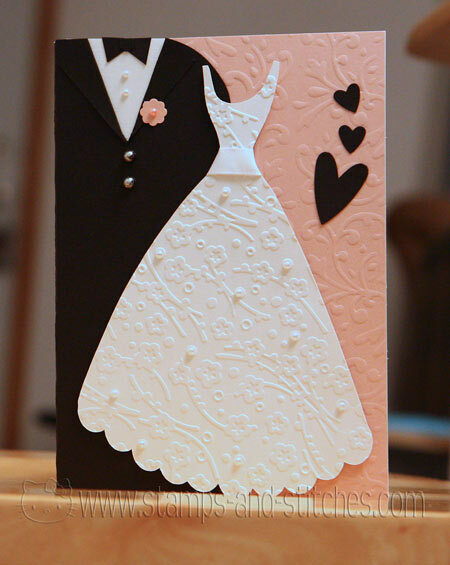 Loved that you used embossing with a Silhouette file. Gorgeous Gale! I love it!! Oh my goodness, your card is gorgeous. Absolutely gorgeous card, Gale! I may have to CASE this one! Wow, lovely card - beautifully done!